Known as the “Cradle of the American Circus,” Somers is a charming historic town offering ample opportunities for nature lovers to explore the more rural aspects of Westchester County. 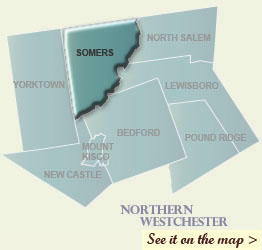 With scenic lakes, ponds and farmland, as well as a portion of the North County Trail, and with Muscoot Farm, an early 20th century interpretive farm on 777-acres along Route 100, Somers is the ideal place to enjoy the area’s beautiful natural landscape. Muscoot Farm: Visitors stroll through historic buildings, visit with the animals, participate in educational programs or hike the many miles of trails at this farm that preserves and interprets the agricultural, cultural and natural heritage of a Westchester County farm. Circus History: Somers is known as the “Cradle of the American Circus,” and gained this distinction when resident Hachaliah Bailey bought an African elephant, named Old Bet, and toured with her throughout the Northeast. Bailey’s success caused numerous others to tour with exotic animals, and during the 1830’s the old-style circus and Bailey’s attractions merged to form the modern circus. Bailey later erected the Elephant Hotel in honor of Old Bet, and today it is a National Historic Landmark and the current Town Hall. The hamlet area was listed as a historic district on the State and National Register of Historic Places in 2004. The Elephant Hotel (1825), Mt. Zion Church and Burial Ground (1794) and the Wright Reis Homestead (c. 1842) are open for public visitation during holidays and special events.